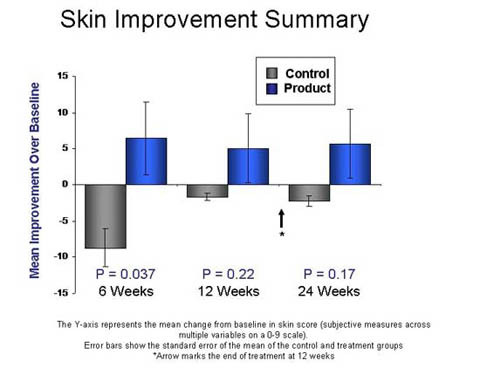 The Pivotal 2005 Anti-Aging Trial of TA-65 was a double-blind, placebo controlled, 24 week study in which subjects consumed 2 or 4 tablets daily of a placebo for 12 weeks or 2 or 4 tablets daily of a TA-65 precursor molecule (TA-41) for 12 weeks. Thirty-six male subjects, between the ages of 60-85, were recruited. Subjects were randomly assigned to the placebo group or the TA treatment group. 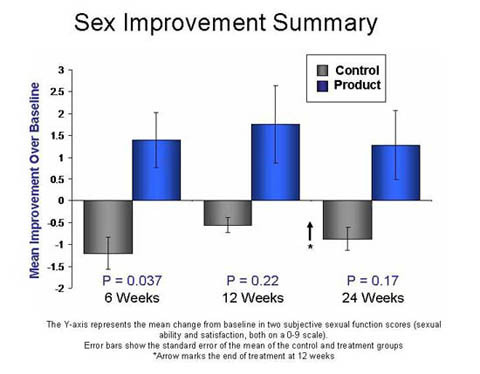 Subjects were assessed at baseline and at 6 weeks, 12 weeks and 24 weeks from the first dose of TA. Statistical Methods Statistical analyses of multiple economic, demographic, health, and lifestyle-related measures showed no indication that the subjects who were assigned to the TA groups were significantly different at baseline than those who were assigned to the placebo groups. The average of the individual changes at each time point in the treatment versus the placebo groups are compared using a Student’s t-test statistic. A two-tailed t-test was used. Small p-values indicate that differences are significant, i.e. likely not due to chance. 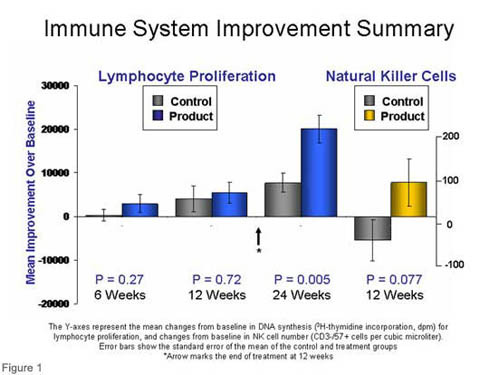 Lymphocyte proliferation was measured at baseline and at 6, 12, and 24 weeks using a standard assay in which white blood cells are exposed to a potent plant antigen called phytohemaglutinin (PHA) which primarily activates T lymphocytes. The increase in lymphocyte proliferation under conditions of strong stimulation with PHA suggests that TA improves the proliferative response of the immune system to foreign agents. At 24 weeks the difference in the individual responses in the TA group was highly statistically significant from that in the placebo group (p=0.0049). T lymphocytes comprise the cellular “ADAPTIVE immune system,” which protects the body against foreign invaders by mounting a strong and specific immune response to threats, both old and new. Natural Killer (NK) Cells NK cells are specialized lymphocytes belonging to our “INNATE immune system.” NK kill foreign cells (like bacteria), or host cells that have been hijacked by cancer or viruses. They manage this even without having been previously exposed or trained. It is known that NK cell function declines with age. 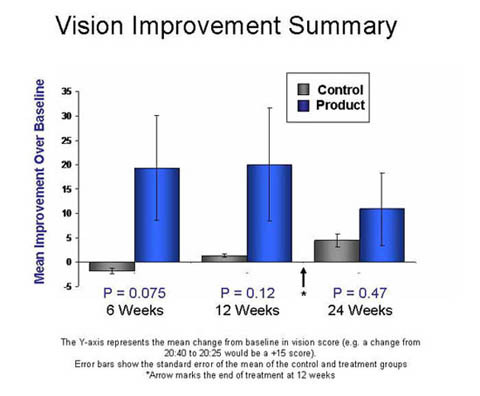 The treatment group had an average increase in NK cell numbers of about 14% at 12 weeks, while the NK cell number in the placebo group dropped about 10% in the same time period. The improvement in NK cell numbers suggests they could have an improved immune response against foreign or abnormal cells in the body. As with vision and the immune system, there has been significant research on the role of cellular aging and telomere attrition in several types of skin cells, including keratinocytes and hair follicles.